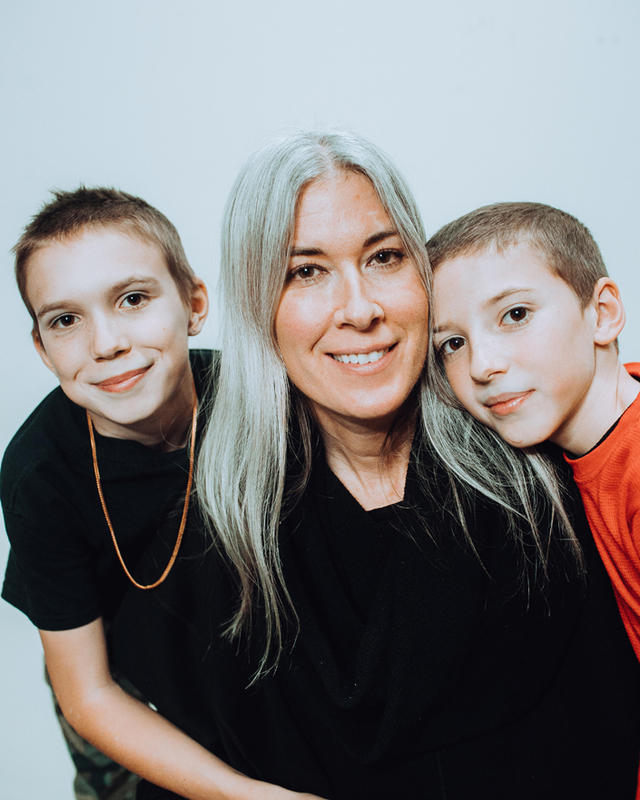 Running a successful PR company that has remained strong for 20 years in the face of a constantly shifting music scene is no small feat, especially when you factor in making time for motherhood. It’s evident that Kathryn Frazier, founder of in-demand agency Biz 3 and cofounder of the OWSLA record label and creative collective, has the traits needed to thrive. Despite her beyond-hectic schedule and a mountainous inbox of unread emails, the single mother of two—8-year-old Angus and 13-year-old Hollis—still has time to meditate, exercise regularly, visit her shaman, and attend each and every one of her kids’ sporting events. Biz 3’s roster reads like a genre-jumping who’s who of top-tier festival regulars—Skrillex, Sigur Ros, Lauryn Hill, Bassnectar, Run the Jewels, Daft Punk, Die Antwoord, J. Cole—and many more, including chefs, comedians and Chicago Bulls superstar Jimmy Butler. But it’s Angus and Hollis that always get top billing. We sat down with Frazier to discuss co-parenting as a single mother, the importance of self-care, and what it takes to bring up two boys in the “overly privileged” city of Los Angeles. I’m amazed to see how you make it all work—motherhood and running your business. How do you do it? It’s like a giant Tetris-meets-Jenga puzzle. How do you make the whole thing support itself without it falling down? A big thing for me is self-care. I meditate, I drink essential oils and put them on me, I go to a shaman, I read inspirational new-age hippy books, I go to meetings of cognitive therapy, I go to a therapist, and I have a trainer for exercise. I also go on hikes. I do all that stuff at least every other day. It keeps me a well-oiled machine that can handle all the work I have to do, all the calls, the running around, and also the kids’ soccer sessions, homework, tutoring and more. How did your journey of self-care begin? How did you realize its importance? I used to be a non-exercising, chain-smoking goth for many decades, until I met my ex. He was the one who said, “You seem kinda aggro. Have you ever tried yoga or meditation?” It’s funny, because I really took it and ran with it. Once I got one little bite on what that could make you feel like, I just went full in. Are you married or a co-parent with a partner? I am a single mother with an incredible ex-husband co-parent. We work together, but he is on tour a lot. I am a true single mother for about half the year, maybe. Do you have a nanny or any other type of help? The kids are now in school, and they do go to an after-school program two days a week. However, I have this thing: I make sure that I am always dropping them off at school and picking them up if their dad is on tour and also making it to their games or events. I understand why people use nannies and they have to do that; I personally have an aversion to getting help after school. Their dad lives here in Los Angeles, and that is great. I probably should hire someone to help more in order to make it less hectic, but I also just want to be doing it. Do you feel like you don’t want to miss out on anything—like you want to be there for it all? Nothing will replace being there for the firsts. Yes! I don’t want to miss out on anything, and I feel like a working mother with the mentality of a stay-at-home mother. That’s my deal. It’s hectic. I am a disaster by the time I get them to bed. Sometimes I then look at the 300 unread emails, or I surrender and do it the next day. You are a career woman putting her kids first. Yes. I really am thankful for my thriving career, but as a kid who grew up with parents who worked very hard, there were layoffs and a lot of working with not a lot of money coming in. I am very grateful for doing what I love and getting paid for it, but my kids transcend everything. Co-parenting is rough, but it all works out easier and better for the child if both parents work together to raise the child, even after separation. I have a very strong situation, and I talk to a lot of people about how co-parenting works best with me, since my ex is very supportive of being in our children’s lives. My friends who are single tell me that they want what I have: a supportive ex who co-parents. I can’t say that our children have no residual effects from our divorce, but if they do, it is so minimal. How do you both keep the children from feeling the effects of a separation? We make sure to spend as much time as possible with the kids, especially holidays. They see us every day. We have family day on Sunday, where we all hang together. Our current partners are invited as well. We’ve done many family vacations. It is very integrated. They have their family completely. The site KidsBeforeConflict.com is a great guide, and it also talks highly of what you do—a lot of child-centric family time. Thank you for this. So glad this exists. That is all kids want. They just want to be around their parents together. It’s really powerful, and we are so happy that we are able to do it. At the end of day, the most important thing to do is give our children a sense of family and safety. We brought these kids onto this earth; we gave them a family, and they deserve to keep that family. This trumps all adult emotions that can get in the way. Do your kids love music, too? Oh, yeah—they are so immersed. I had this really awesome moment. We were driving to school yesterday, and I said, “I wonder who the first person was to tag a beat? You know, when a producer tags about every beat they have.” Hollis is sitting there looking out the window, and he says, “I am not totally sure, but I definitely know that J Dilla did it.” I was floored that he would even know who J Dilla was and that he would know that. Then you realize that they have their own mind and own path. They can find their own ways of music, modern and past. I suppose that having a mother who works in music and a father who is a musician who tours worldwide and collects records, he will get it. For his birthday he got Ableton, a keyboard and headphones. He’s gonna make beats and do his thing. Do they attend festivals or shows with you? All the time. In the beginning, we had to when their dad was on tour. They used to just love the ice cream backstage. I’m finally at the age that they really love what I do. My kids are huge music fans, and they have grown up knowing these people. They love the artists I represent, and they always want to go to the festivals to see them. Is there anything negative you encounter when taking them to events? The most important thing I am working on now is making sure they don’t grow up to act privileged. I really worked to get where I am, and they don’t have to. It’s given to them. L.A. is an overly privileged city. While I take my kids to shows and backstage, I want them to also feel thankful. They are very appreciative kids, so it is going well. Are there any challenges you have had as a working parent that you would like to discuss—advice for those in our industry? [Laughs] Do we even have enough time? My message is this: If you can stay really present—and just take each thing as it comes—you will more than likely knock it all out. I do fail sometimes, but you keep going. For me, a big part of it is time organization—having an established daily schedule—and again, self-care. By doing it, one can become a less angry person and deal with life’s disappointments without getting upset, which of course some days this goes out the window and I’m a stressy frazzled mess! In the end you just keep honing how to be still and accept the present.